They can be analyzed, counseled, reasoned with, prayed over, threatened, beaten, or locked up, but they will not stop until they want to stop. I will accept that I am powerless not only over my own addiction but also over everyone elses. I will carry the message, not the addict. I remember once upon a time I was trying to help someone who wasn’t ready to stop using. I used to get so frustrated and angry. I realize now that you cannot force your will on someone else. I cannot make anyone do anything they are not ready to do. You can only offer support and hope that they come to a point where they are ready to change. You can literally drive yourself insane trying to make someone stop using. If your an addict like me you will wind up using before you get someone clean. I know this from experience. 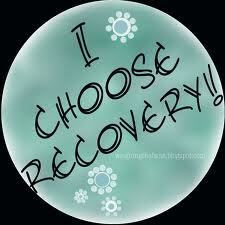 It’s been said that recovery is for those that want it not those that need it. I never understood that until I came into the rooms. I came in needing help I was at my bottom and didn’t know how to climb out of the hole I dug for myself. Now that being said you would think that I would be willing to do what it takes not to use again, but I wasn’t 100% willing and I picked and chose what I would and wouldn’t do. Needless to say I relapsed. You see I needed recovery but I truly didn’t want it. I still wanted to use I just wanted to find a better way to use. I still thought I could somehow control my addiction. I didn’t know this at the time but I know it now. I am in a process of learning myself and I make mistakes (not with drugs) I am learning to deal with everyday situations that before used to run me out the door to get high. Today I know that I have options. Today I put myself out there to help others but if they are not ready I can still try to help but it will be from a distance. I can only do but so much and if they are not willing then there isn’t anything I can do. I can only pray that they see their own destruction and want to do something about it before its too late. I had to learn the hard way. I was not willing for years to hear anything anyone had to say. I lost a lot but I was lucky I didn’t lose my life. I understand what its like because I was there not too long ago either. But today its different and I want to live a better life so I fight the good fight and so far I am alright. I didn’t do it on my own. I have God in my life today and it has made a big difference in how I see things. Also I have my sponsor, home group and my network all who cared for me and loved me when I didn’t love myself. I am a work in progress but I am making progress.